Are you the kind of person who would fight with honor, honesty, valor, and loyalty? Would you protect the weak, and defenseless? How about eschew unfairness, meanness, and deceit? The kind of person who would speak the truth at all times? Yeah? Well then you might have what it takes to be a knight. In the time of knights, and kings. When matters of state were dealt with on the battle field not in the House of Representatives, there needed to be something to keep knights from going rouge. From using their power to overthrow the king, or suppress their subjects. And that was the Code of Chivalry. Oddly enough, this is also where we get the idea of never turning your back on your enemy. As we have already established you have the integrity of a knight. But do you have the attire? No? 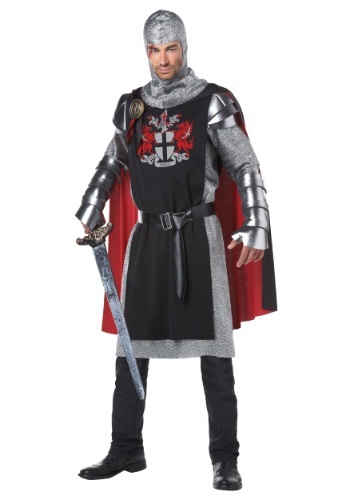 Well this Men's Medieval Knight Costume will help people identify you as the knight in shining armor you are. You would be willing to stand up for those who can't stand up for themselves. Help orphans, and widows. You are just a good guy. And people should know that. They should know that you would pick up your sword to defend your King, and your subjects. You would lay down your life in honorable battle for the good of the Kingdom.